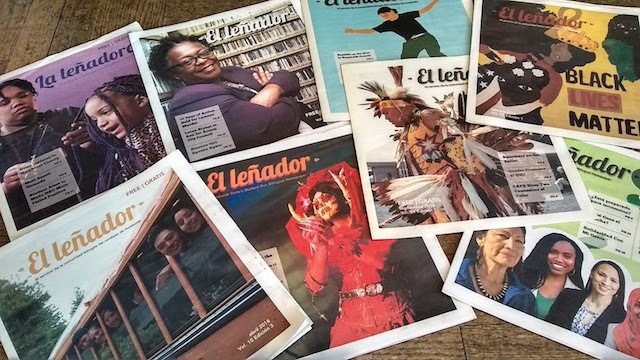 El Leñador, the student-run bilingual newspaper at Humboldt State University, won first place in six categories in the 2019 California College Media Association statewide awards competition. The awards were presented on March 2 in La Jolla. The newspaper also placed in an additional six categories. The English and Spanish newspaper, which focuses on covering Latinx and diverse communities at HSU and Humboldt County, took first-place awards for Best Photo Series, Best Feature Photograph, Best Feature, Best Illustration, Best Website, and Best Inside Spread/Page Design. El Leñador staff also took second-place for best sports photograph and third-place for best special issue; plus honorable mentions for best news series, arts and entertainment story, newspaper front page design, and podcast. El Leñador was founded in 2013 and is published monthly during the spring and fall semesters and online at ellenadornews.com. The print edition is distributed on campus and locations around Humboldt County, including Arcata, Eureka, Fortuna, McKinleyville and Trinidad. In 2016, El Leñador was named Best Non-weekly Newspaper by the California College Media Association in 2016.